Posted By:Unknown | At:10:48 AM Be the first to comment! Anderson Cooper's AC 360 conducted a year long study on children and race that he began showing this past week. What was revealed may come as a shock to some, but to most of us is not very surprising. A lot of us have always been of the adage that racism is learned behavior and not something inherent in all of us. AC 360 commissioned child psychologist Dr. Melanie Killen, to design and implement a study to investigate a concept known as "subconscious racial bias." This is described as "a bias that kids pick up on– from messages they hear at school, at home, the characters in the TV shows they watch, what they see online." As Killen points, these are not overt feelings of racism, but rather "the things that we're not aware of, the things that we do when we don't realize it." Killen showed the ambiguous pictures to a group of 145 black and white children across six states. With each of the kids, she would ask them what was going on in the picture. Overall, black first-graders had far more positive interpretations of the images than white first-graders. 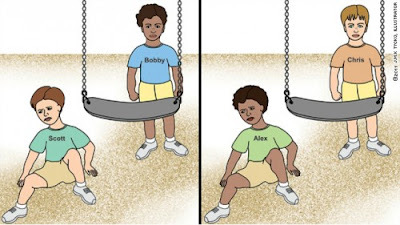 The majority of black 6-year-olds were much more likely to say things like, “Chris is helping Alex up off the ground” versus “Chris pushed Alex off the swing.” They were also far more likely to think the children pictured are friends and to believe their parents would like them to be friends. In fact, only 38% of black children had a negative interpretation of the pictures, whereas almost double – a full 70% of white kids – felt something negative was happening.